Well, Amazon says Kindle 4 is lighter, smaller, faster, better, blah blah blah. To me, I still prefer Kindle 3. Why? First, Kindle 4 does not have audio playback capability. That basically means NO Text-to-Speech, and Audiobook, music, song, and such. Furthermore, you have to use 5-way navigator button to move your way around your virtual on-screen keyboard every time you do some typing. What a tedious task! Most people buy Kindle to read books and just that. They don’t use the built-in browser to surf the Internet, cause they might find it frustrating to move their way around. If you think you’re one of them, then go for the Kindle 4, as it is cheaper, faster, smaller, lighter, and considered as newer models. Kindle Touch is also a good choice if don’t like Kindle Keyboard, as it has the new X-Ray feature and Audio playback. 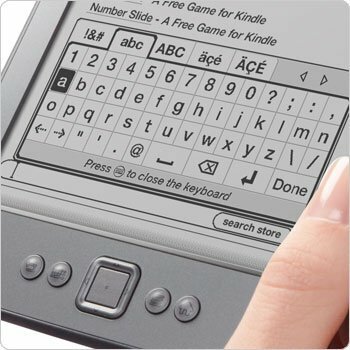 However, if you are not interested in X-Ray feature or don’t like the idea of E-Ink Touchscreen, and believe that you will utilize the physical keyboard for browsing, emailing, and so on, then you might want to consider Kindle Keyboard.. This entry was posted in Kindle Devices, Opinions and tagged Amazon Kindle, Kindle 3, Kindle 4, Kindle Devices, Kindle Keyboard, Virtual keyboard.